YS Tech USA announces the new EC Motor for light Industrial applications. (March, 2013) Now, enter the EC Motor. The electronically commutated motor has no brushes, does not generate heat and can be precisely controlled at most any speed desired. Sounds like some great advantages, don’t they? Well they are, and what makes it possible are the electronic components that are doing the electrical switching and control. EC motors look like this. The part on the left has all the electronic components that do all the switching and motor control. The part on the right is motor. Yes, it looks a bit more complicated, but the electronic components are more reliable than the old brush design. 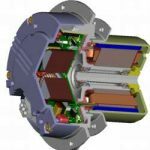 As you tech types may have already guessed, the EC Motor is a form of Brushless DC Motor, or BLDC. The electrical supply can be 120V or 240V AC and the components rectify the source to a DC, three-phase supply [actually, I think the number of phases depends on the particular design]. And I’m sure you have already figured out because of the electronic components, speed control is easy. That graphic was just a generic representation of what a typical EC motor might look like. But now, we have our own design stabilized .. and here is what it looks like: We are releasing it as a standalone motor with the customer’s choice of impeller (250 – 280mm)! In addition to customers being able to choose the impeller they want, they can also have a choice of frame. The details are a bit sparse so far because the factory is just releasing this new EC Motor THIS MONTH! I’ll get all the detail information out to you guys as soon as I receive it. We are calling it the: – Green and Smart technology! I know you experienced cooling fan sales Engineers are wondering who uses these types of fans. Well, they are intended to support: refrigeration, HVAC, household appliances, telecommunication and data center cooling manufacturers, to name just a few. Do you have any of those companies in your region? EC Motors: run cooler and quieter [no RF noise because no brushes], can be controlled to most any speed, and is very efficient! I’ll be covering all the advantageous offered by the EC Motor design when I receive more specifics from the factory. Until then, call me with all your EC fan questions.